Illinois Gov. 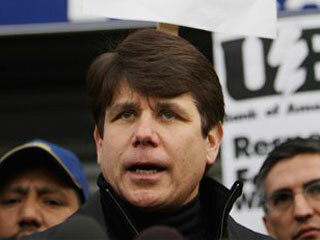 Rod Blagojevich was arrested Tuesday on charges of conspiring to get financial benefits through his authority to appoint a U.S. senator to fill the vacancy left by Barack Obama's election as president. Pass the smelling salts -- USA Today's Judy Keen began her story by identifying Blago as a Dem in the first word of the first sentence. And Reuters's 10:38 a.m. report (probably dynamic) identifies him as a Dem at the beginning of its second paragraph. This MSNBC First Read report doesn't have Blago's status as a Democrat in its story, but did "tag" it. The UPI's 10:12 a.m. story has no party ID. Finally, in what would seem to be a very odd twist, a pretty long story at Fox News does not identify Blago's party anywhere in the story. A more typical example can be found in the arrest and resignation of Cleveland, Ohio councilman Robert J. White III over a bribery charge. The Cleveland Plain Dealer and other area news outlets earned outright "F's" for totally failing to identify White as a Democrat. The scope of the alleged crimes Illinois Governor Blagojevich stands accused of is, as U.S. Attorney Patrick Fitzgerald stated, "truly staggering." Go to the links for more.